Milan (Italian: Milano) is the second-largest city in Italy and the capital city of the region of Lombardy and of the province of Milan. The city proper has a population of about 1.3 million, while its urban area, roughly coinciding with its administrative province and the bordering Province of Monza and Brianza (...)(from Wikipedia). The route we will be taking from Riez is a scenic one, so we should get a very early start to our drive. ETA Milan 4 o'clock. Tonight visit the Navigli District recommended by Frommers. "If you have one night in Milan this is where you should spend it". Pick Nicole up from airport at 2pm. 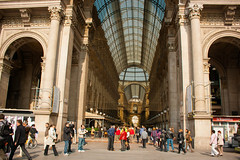 Visit "The Duomo", located in Duomo Square in the morning. Climb the roof for spectacular views. Roof open 9am to 5.30pm. Stairs 7E and lift 12E. Only 250 steps. Time permitting we could also visit Via Dante one of the grandest and most frequented fashionable high streets in Milan and or the Piazza Della Scala (the location of the statue of Leonard Da Vinci and La Scala theatre), a grand square. Arrive from USA. Depart to USA. Day 1: Pick up car.